The Panthers looked solid in their season opener on the road against the 49ers, and the 49ers struggled to get anything going. Here are the highlights. The Carolina Panthers are off to a good start in the 2017 season as they look to try and retake their spot atop the NFC South after a year away from the postseason, and they started strong with their big 23-3 win over the San Francisco 49ers on the road. While the Panthers couldn’t get the production they may have wanted to see from rookie running back Christian McCaffrey in the backfield, they did get some solid scoring elsewhere in the win, albeit against a weak 49ers defense. Meanwhile, the 49ers couldn’t get anything going on offense with Brian Hoyer leading the way, and their only points of the game came on a field goal in the third quarter against a Panthers defense that isn’t anything to brag about. The Panthers offense wasn’t exactly anything to brag about, and they didn’t exactly light up the 49ers defense despite San Francisco’s inability to do anything right. However, Newton did look good enough in the season debut, and looks like he may have just been fighting off some rust to open up the year. He went 14 for 25 with 171 yards and two touchdowns, but he did throw a pick during the game that likely will be a big discussion point through the week. The Panthers defense was solid against a relatively weak 49ers offense, but that doesn’t take away from the impressive performance Davis put on for the Panthers throughout the game. He put a ton of pressure on Hoyer throughout the game, with seven tackles and a sack to show for it on his stat line, and he was all over the place for the Panthers during the big win. Stewart proved to be a solid dual threat that most thought McCaffrey would be in the Panthers backfield, and he had some great production both running the ball and catching it, with 65 rushing yards and 17 receiving, along with a receiving touchdown to add to his stats. He’s a real winner this week, especially because many thought he may lose a lot of his touches with the rookie added to the backfield. 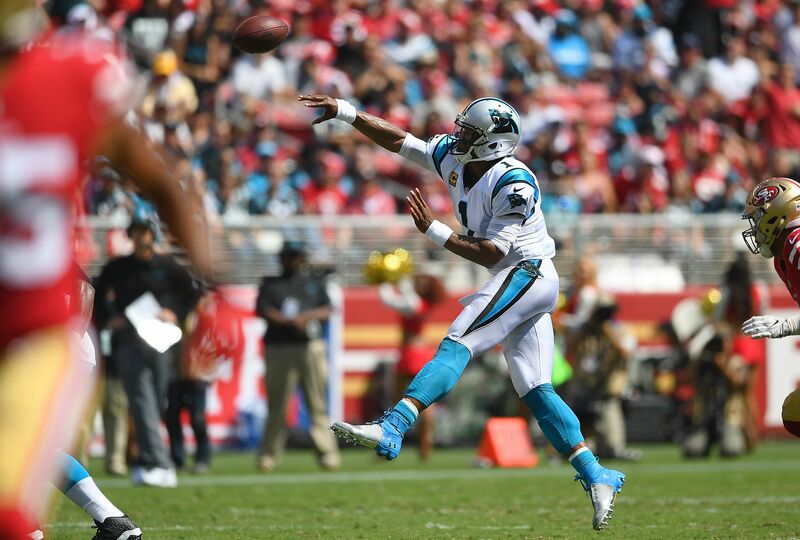 The Panthers were favored -5.5, according to SportsBook Review, and they lived up to the billing with a big win to open up the year, although not many expected them to lose their opener against a weak 49ers squad. The Panthers will head home for a game against the AFC East-leading Buffalo Bills next week, while the 49ers will look to bounce back from the tough loss with a tough game on the road against the Seattle Seahawks to try and gain back some ground in the NFC West.